Thinking of Setting up a SQL Server Users Group? The work of setting up a SQL Users Group isn't always easy, but, as Karla relates, it can be a very rewarding experience. She gives some detailed and useful advice for anyone wishing to get a local group up and running, gleaned from her first year with the excellent Pensacola SQL Server Users Group. Last May my fiancée, Rodney Landrum, and I attended our first SQL Saturday in Jacksonville Florida. Little did I know that morning on the five hour drive from Pensacola, that within just six weeks, we would be launching our first meeting for the new Pensacola SQL Server Users Group. We were so inspired at the SQL Saturday and saw what a great avenue it was for delivering so much knowledge to so many, in just one day, and for free, that we just had to bring that to our hometown. Of course I wanted to come back and go straight to organizing a SQL Saturday, but was given some great advice by Microsoft Evangelist Joe Healy (www.devfish.net), that I should “start small, then go big”, not the other way around. Joe’s other added advice, when I asked him “ok, how do I get started”, he told me that he wasn’t going to tell me what he has seen others do, to do what I think would be best. After doing this now for nine months, I now know why he said that to me. There have been many user groups started that are fledgling now, and so with this article, I hope to share some of what we’ve done to get started, and what we are doing as we continue to strengthen here in our own community. It takes a lot of work, selflessness, and much of your spare time to start and manage a users group, so first you have to ask yourself why are you interested in beginning a users group. I firmly believe it has to be for the right intentions and primarily on something that you feel passionate about, whether it is SQL, .NET, SharePoint, or some other technology, it must be at the very least interesting to you yourself. Rodney and I both use SQL daily at our jobs, and we both love using it (yes, he sports the tattoo to prove it, I’m not quite that daring yet). Often I’m asked why we began a users group, our reason is simple. We wanted to provide locals a place to come to where they can learn new technologies and network with others who have similar interests, and do it all for free, especially with so many companies cutting back on travel and additional education for their employees. Our area suffered many job losses over the holidays, several of them our own members. With networking at meetings like users groups, and expanding attendee’s knowledge levels, local IT professionals likely will not have to look outside of Pensacola for work. This also provides local companies a huge advantage as they do not have to hire outside of our area, thus costing them in global advertising and relocation expenses. To get started quickly, we went ahead and purchased the URL pensacolasql.com. At that same time, we applied with PASS to become an Official Chapter of PASS, which if accepted, you actually get web hosting for free, so if you aren’t in too big of a rush, I would recommend that so you aren’t using your own money to purchase a website and hosting. We use the website hosting from PASS now, and just have pensacolasql.com reroute to that site, Pensacola.sqlpass.org. The staff at PASS were very quick with getting us through the very little red tape that it took to get official. To my knowledge, the only real requirement was that we didn’t have another SQL Chapter within so many miles of our location. Since we wanted our first meeting to be in June, we primarily got the word around with those we work with and with flyers we created that we had posted out at the colleges. I would say probably the toughest part in the beginning was finding a place to hold the meetings, and if not for free, as close to free as we could get. Our first meeting was held at a room at the airport, the cost for the room was 50 bucks. We had 12 people show up, and I’m pretty sure that included Rodney and I. The room had all the proper equipment; however the airport charged our attendees for parking, the usual airport parking fees. We did a survey at that first meeting, and no surprise, everyone suggested a different location. For the second meeting, we couldn’t find another venue that low in cost, so we decided we would just reimburse everyone their four dollars for parking. Well, the turnout by that second meeting was 34 people, elated we had such a big turnout, but what a hit to the wallet. We had standing room only, so we knew without a doubt we had to keep on the venue search before that third meeting. During these first couple of months of searching for a venue, but not wanting to hold up meetings getting launched, regardless of what it was costing us, I had started trying to find a local company that would sponsor our meetings and/or provide a venue for us. As luck would have it, TEK Systems, a recruiting company based out of Tallahassee, was expanding a set of team members to cover the Panhandle. One of our members was in touch with one of these reps, and made the initial email intro between her and me. What fantastic timing, and really a perfect match. We had something they wanted, local folks possibly looking for jobs, and they had what we needed and that was the funds to cover our next venue and good eats. TEK Systems has had great success here in our area, one of their reps tries to come to each meeting, and have generously sponsored every month’s meeting since. Our meetings are now held at historic Seville Quarter in downtown Pensacola, and they do the catering for the event. In regards to food at the meetings, it really is essential, since meetings are held directly after work for most attendees. You can find sponsors who will, for example, do pizzas for one month’s meeting, but some other good advice, this time from another user group leader, suggested that we “not do pizzas”. Our first meeting we picked up a couple of food trays from our favorite local Cajun restaurant, and the second meeting from Carrabas. Yes, out of our own pockets, but honestly the prices weren’t too bad in comparison to the cost of pizzas, so why not offer some good food. At our current venue, in order to keep the food portion of the bill down, we had to agree to let it be “Chef’s Choice” for each meeting. I would suggest trying to “sell this idea” to one of your favorite local restaurants. Basically we get whatever the specials were for that day. I knew we couldn’t go wrong since Seville has some of the best food in town. So far all of this is standard and advice you can read anywhere online or in the Chapter brochure that PASS sends to you. I would say though that something we do differently and that we feel really has contributed to our strong, consistent attendance is the fact that we try to have two speakers at each meeting. One topic on SQL each month, usually done by Rodney (yes, I’m lucky to have a SQL guru, and now MVP, in my own backyard), and then one on another technology and typically from a guest speaker. I often hear that finding speakers is difficult for other leaders that I meet, but I honestly can say we have not experienced that at all. There are so many willing and very good speakers out there, and love presenting to user groups. Someone said to me once “you seem to know so many speakers”, well, I didn’t until I started attending events like SQL Saturdays and Code Camps. Every event I go to, I bring flyers (most events will have a table for user groups to place info at), I introduce myself to as many people as I can, and just basically let them know the thirst and enthusiasm our members have for knowledge. We also want to build our own “speaker pool” here locally, but finding that to be a bit of a struggle so far. Not sure if folks are shy or timid, or what, but we just keep encouraging them so hopefully they’ll try it some time. Something we also now are trying to do with our neighboring user groups over in Mobile Alabama (LANUG) and in Fort Walton Beach Florida (Gulf Coast .NET User Group) is “piggy back” speakers. On months where we can have our meetings back to back in the same week, we are finding it easier to promote ourselves and making it easier for speakers to “sell” the trip to their employers because they can have potentially two to three audiences on one trip to the Panhandle. Only downfall to this is if something comes up and that speaker has to cancel, we all lose out (yes that has happen to us once). Once things started really kicking into high gear, it was very apparent that we needed to get some others on board with us to help with some of the duties, such as website upkeep and meeting minutes. The guide PASS sends out does provide some guidance on this as well, and what “officers” to be recruiting, just in the beginning it didn’t seem too necessary. Quickly though we realized the importance of getting others involved, and thus we created the roles we felt our particular group needed. We sent a list around of these roles with a brief description of the duties involved, and just had members volunteer for any position that interest them. Lucky for us, we had someone volunteer for every role we wanted to fill. We are still organizing and “tweeking” some of this as we go, but we started with a website admin, newsletter editor, stats keeper, members list coordinator, and event coordinator. Even though each has some specific duties, all our now board members and even members are always there for us and willing to pitch in for anything necessary. Trust me, we couldn’t have maintained this pace in growth without them and we are so very grateful to all of them. Along with an ideally located venue, great food, a regular sponsor, quality speakers, and devoted volunteers, something else we make sure to provide at each meeting is swag. There are many companies out there that provide some sort of users group program. Most all technical publishers are great for sending free books and discounts for giveaways (something our members seem to really enjoy, and with the cost of some of these being so high anymore, it is a great prize indeed). Other user group programs include Ineta, who sponsor a speaker for your meetings, by paying the expenses of the speaker to come to your locale; software vendors such as Red Gate, provide great giveaways like thumb drives and t-shirts, and some of these vendors will also give away licensed copies to their products. Giveaways are a great way to draw attendance to the meetings, and companies know in return they are getting their name and products to audiences that they may not have otherwise. Some of these companies will provide more if you will give something in return, such as doing a 15 minute presentation on one of their products. Others will sponsor your food for your meeting and in return are given time to do their own product presentation, either onsite or remote such as a webcast. For us, none of them have asked anything from us that we felt is out of line or asking too much, we put all their logos up on our websites, and for each month’s meeting, their logo goes on the flyer along with TEK Systems as being that particular month’s sponsors. But these vendors don’t come to you, you must do the legwork to get in touch with them and build rapport so that they will continue to sponsor your user group. I hope this helps to answer any questions those looking to start up a users group may have. I encourage you to go for it. It will be a lot of work, but your life will be richer for it. We are excited that for our one year anniversary this June, we will be hosting our very own SQL Saturday right here in Pensacola. If you know me at all, you know that just typing this not only puts a smile on my face, but brings tears to my eyes. We owe it all to those who have inspired us, our Microsoft Evangelist Team, MVPs everywhere, Andy Warren and staff of SQL Saturday, Sponsors, PASS, and most importantly our members. Thank you guys! Karla has spent the past 10 years working for HealthWare Corporation, a Microsoft Certified Gold Partner that specializes in IT solutions for the healthcare industry. Her role started out in software sales, and over the years has evolved into heading up the support department, to include overseeing implementations, tier 2 support, and is the lead trainer on the software. Karla's current passion is focusing on community efforts surrounding IT, and in doing so, working to expand her own SQL knowledge. Karla, is the most focuses, passioned, and dedicated group leader I have seen in a long time. Whe she is commited to something she sees the succesful end product in her mind and persues it until completions. Commitment, dedication and Vision is what drives Karla on all this projects. Her personality and contagious smile transfers the energy to all of us to keep on going and fighting in this difficult times. Keep it up Karla!!! 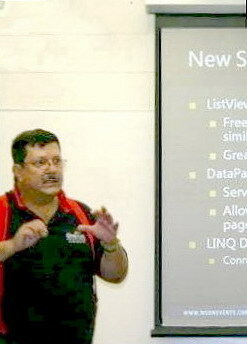 As a member of the Pensacola SQL Server Users Group, I thank you and Rodney for all the effort you’ve put into setting up,maintaining, and growing our group. With all the enthusiasm you’ve shown in bringing knowledge to our local community, it’s not surprising that you’re stepping it up a notch to help others outside our area with the guidance from this well written article! The only thing missing is a couple well placed, “WooHoo’s”! Karla, It take a leader to make a community. Your strength and passion are what makes it happen. Can’t wait to see ya’ll this Saturday at the codecamp/sqlsaturday in Pensacola. Trying to run a user group myself, it sure sounds like you’re doing a fantastic job. Thanks for publishing the article. It provides some good food for thought. I have the pleasure of working with Karla every day and know firsthand that her passion for SQL, PUG, and SQL Saturday is always present. As a self proclaimed “geek,” Karla is constantly helping others get more knowledge in the technology industry and is truly dedicated to putting Pensacola on the map. But this is no easy task. She works at it every day. While you can tell it is very rewarding, it takes a lot of work and dedication to keep the numbers and sponsors coming in. I’m sure her smiling personality goes a long way with this as well, since anyone who knows her knows she is always smiling and having a great time. If you are fortunate enough to meet Karla and attend this coming SQL Saturday on June 6, 2009 you will be very impressed. She has put together an amazing event with a great group of speakers, sponsors, and volunteers. I’m looking forward to everything we are going to learn! And if you can’t make it, you should definitely try to attend one of her monthly meetings at some point, especially if you are interested in starting your own users group. The knowledge that Karla and Rodney possess is invaluable. … Karla, you know I think you’re an inspiration. I hope we get to work together again soon. You are by far the most passionate and committed community professional I’ve ever met and others could learn a vast amount from your expertise. Keep at it girl and good luck this weekend. I can’t believe it’s finally here! Thank you for all the kind words, you are all so sweet! I’d love to hear what other user groups are doing to make their efforts successful, please post your suggestions. The more the merrier! I should have mentioned in the end that we definitely couldn’t have pulled off a SQL Saturday without all the generous speakers who are devoting their time and own expenses to come to Pensacola and share their expertise with us here. Without you, there would be no show! Thank you! Thank you for sharing, we have started a new users group in Melbourne, and your ideas that you have shared are very helpful. I am sorry I will miss your SQL Saturday! I have been trying to attend the Florida ones. I wish you the best of luck! I’ve attended numerous user groups from Fort Walton to Pensacola, and Karla has done a fantastic job making this enjoyable and educational.